Facts prove that the events in Azerbaijan’s Ganja city were a pre-planned action managed directly from abroad, a source in Azerbaijan’s law enforcement bodies told Trend July 13. 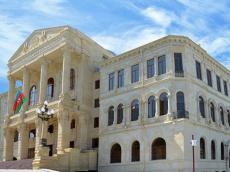 The Prosecutor General’s Office of Azerbaijan, the Ministry of Internal Affairs, as well as the State Security Service of Azerbaijan said in a joint statement that all participants of the bloody crime committed in Ganja on July 10 were established, 11 people were arrested and Rashad Boyukkishiyev was eliminated. During the investigative and search operation it was established that the day before the events, Rashad Boyukkishiyev took all members of his family and relatives out to Georgia, according to the statement. Bakram Aliyev, who is also suspected in committing the crime, arrived from Russia in Ganja July 9. Some collected facts give serious reasons to say that some of the participants were closely connected with a religious extremist organization that cooperated with Armenian special services.